Stamps: Ippity "Cuppy Cakes"; Unity "The Time Is Now"
Such a wonderful card and I really love that you made a card for your mom in heaven. That is beyond sweet and I am so sorry for your loss. Pryn, This card is just lovely and I'm sure your Mom is smiling now that she's seen it. Then again I'm sure she smiles every single day because she has such a fabulously loving daughter. Celebrate your Mom's birthday with love. Very cute! LOVE the kraft paper! What a fabulous card! I know how you feel losing a paretn. I think of my dad every day. Take care. Super cute! and what a sweet idea Happy Birthday to your mom, my dad left us December 15th and it is so hard. Very lovely card - hugs on your mom's birthday - I bet she is smiling down on you! This is lovely, Pryn. I'm sorry you are missing your mom. This is a lovely way to celebrate her. PS - I have a 'use your scraps' challenge on my blog right now and I will allow back-linking just this once. Hi Pryn! Your card is absolutely gorgeous!! 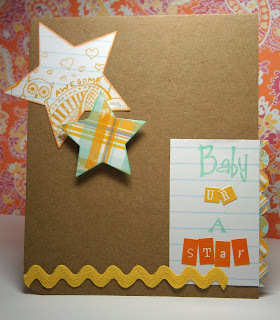 I LOVE the stars and it's such a lovely card for your mom. Take care! Amazing Pryn. Yes, I do make a card for one thing and realize that I'm really making it for someONE else. Sometimes card making is therapy! :) Lots of hugs to you! Awww! That is so sweet! I'm sure your Mom is very touched by all your wonderful and cherish memory and the LOVE that you share for her each and every day! She's your forever star shining brightly from heaven! !